As winter sets in and the weather grows colder, make sure you drink enough water while keeping up with medical weight loss in New Jersey. To keep up with your medical weight loss goals, your exercise habits can’t exactly take a winter holiday. You might even find that going for a jog in the cold weather is a bit more enjoyable than fighting the heat during the summer. As you are maintaining your workout routine this winter, don’t forget to keep on top of your fluid levels. When the snow starts to fall in Hackensack, you are probably more likely to grab your thermos of tea or coffee than you are your water bottle as you walk out the door. If you aren’t careful this habit of drinking caffeinated warm beverages all day can impede your weight loss with empty calories, as well as interfere with your hydration efforts. Caffeinated beverages can actually further dehydrate you, making you need even more water to maintain proper health and power through a workout. When you are working out this winter, dress in layers. However cold you are when you first get started, your body will inevitably warm up as you start to work out. When you are dressed in layers you can accommodate these changes in body temperature. You can also wear clothing made of moisture-wicking fabric so you don’t stay wet out in the cold. 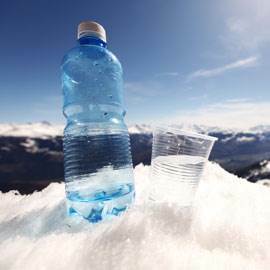 Staying hydrated during the winter can help you stay healthy and on track with your weight loss goals. Ask your weight loss doctor how much water is ideal for your body size and activity levels. Most people need at least 64 ounces of water every day to maintain proper fluid levels.